The Ibrahim Rauza (1627) is the mausoleum complex where Ibrahim Adil Shah II (r.1580-1626) is buried with his queen, Taj Sultana. Exceptionally conceived and finely decorated, it is one of the supreme achievements of the Adil Shahis rulers. Designed by Malik Sandal, a Persian architect, the tomb and a mosque are set in a walled garden facing each other over an ornamental pond, only the tomb is visible in this view. 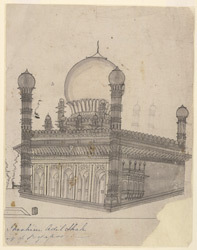 Graceful minarets mark the corners of each building, surmounted by a dome rising from a lotus petal base. The walls of the tomb are embellished with beautiful calligraphic and geometric designs.